(a) Both the numerator and denominator should be divided by cos2x. (b) sec2x, wherever formed in denominator should be replaced by 1 + tan2x. (c) Now, substitute tan x = t and so sec2x dx becomes dt. 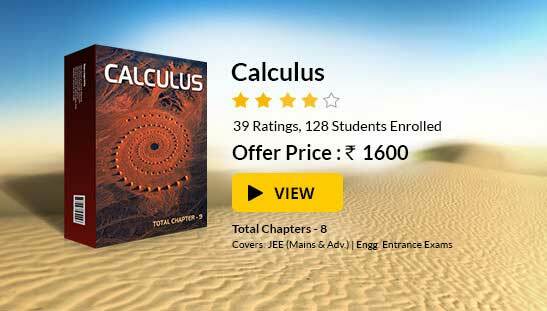 This integral can be easily solved using the methods discussed in previous sections. (b) (1 + tan2x/2) in the numerator should be replaced by sec2x/2. (c) Again, as in the previous case, put tan x/2 = l,so that sec2x/2 dx becomes 2dl. 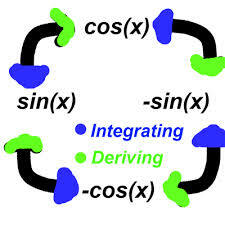 (d) This again reduces the integral into the form discussed above i.e. which can be easily solved by using the methods discussed in the previous sections. (a) Write (a sin x + b cos x) = A(c cos x – d sin x) + B(c sin x + d cos x) i.e. (b) Now, by equating the coefficients of sin x and cos x on both the sides we can obtain the values of the two constants A and B. (b) Now, try to obtain the values of constants by equating the coefficients of sin x, cos x and constants on both the sides. (d) The integral thus obtained in the R.H.S. of the last step can be obtained using the methods discussed earlier. Rule for (i) : In this integral express numerator as l (Denominator) + m(d.c. of denominator) + n. Find l, m, n by comparing the coefficients of sinx, cosx and constant term and split the integral into sum of three integrals. M & N ∈ natural numbers. If one of them is odd, then substitute for term of even power. If both are odd, substitute either of the term. If both are even, use trigonometric identities only. Evaluate ∫ dx / sin x (2 cos2x – 1). Evaluate ∫ √ sin x cos x dx. The given question is ∫ √ sin x cos x dx. I =  ∫ t1/2 dt = 2/3 t3/2 + c = 2/3 (sin x)3/2 + c.
(b) both the numerator and denominator should be divided by sin2x. (c) only the numerator should be divided by sin2x. (d) only the numerator should be divided by cos2x. (a) Write denominator as a multiple of numerator. (a) cos x = 2t/(1+t2), sin x = (1 - t2)/(1 + t2). (b) sin x = 2t/(1+t2), cos x = (1 + t2)/(1 - t2). (c) sin x = 2t/(1-t2), cos x = (1 - t2)/(1 + t2). (d) sin x = 2t/(1+t2), cos x = (1 - t2)/(1 + t2). (d) numerator = C1 (denominator) + C2 (differential of denominator) + C3. (a) substitute sin x by tan x/2. 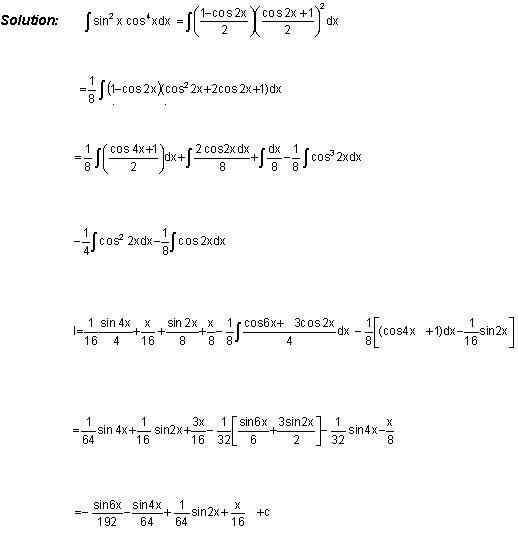 You may wish to refer indefinite integral.